February 2, 2017--Made this beautiful rose into a piped knife-edge pillow. I like the way it looks more like a rose now that the padding rounds out the center. And the fabric color adds a nice "frame". All in all, very happy with the results. My Bernina sewing machine has programming for simple numbers and letters, so I added the following to the back since it's a gift for my mother. I added her name so the staff at the nursing home where she resides will know it's hers if it happens to "walk". January 8, 2017--Done, and in plenty of time to make this rose into a pillow to give my mother on her 90th birthday next month. 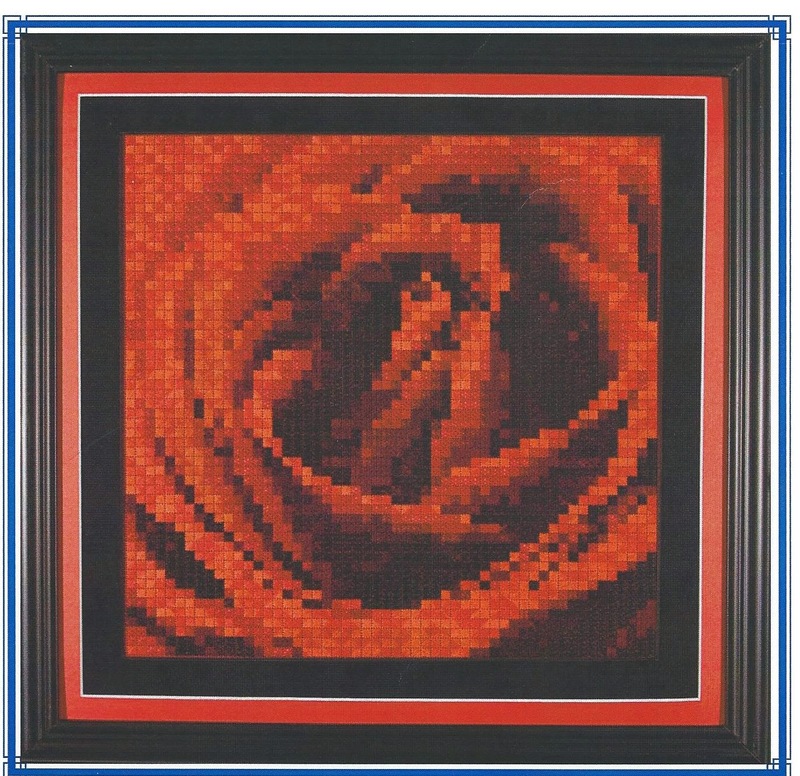 It's an unusual piece--you need to stand far back to actually see a rose. Once it is piped with a dark purple fabric, the rose should be easier to view. December 15, 2016--Wow, it's been over 2 years since I last worked on this project. And work on it I must now do! This is going to be a gift for my mother's 90th birthday in February and I have a lot yet to stitch. I have a small suspicion that it won't get done in time. If that happens, I'll show her the project and explain it'll be a beautiful pillow when done--and promise she'll get it ASAP. In the meantime, however, I'll stitch on it furiously and see if I can make the finish happen in time. November 30, 2014--Status to date. Thought I would do as Liz Morrow has done with her rose (she's stitching hers in neutral tones) and complete a full quadrant. Still am unable to see the rose yet. Will now go back to working on one color/stitch at a time. 10/13/14--This project has 8 different stitches done in 8 different colors. 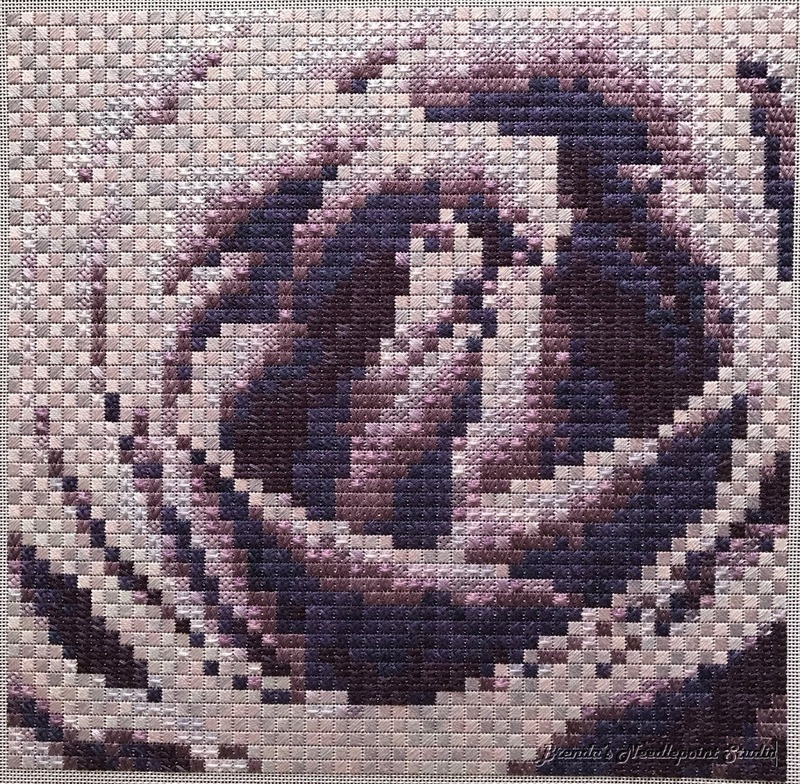 The picture below shows the first color and stitch done, and a little of the 2nd one started (the canvas color is Lavendula/Lilac). 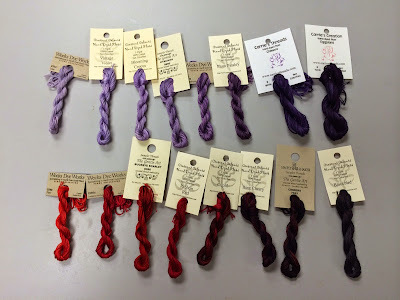 Not doing a lot of stitching these days--have been traveling and more trips are planned. 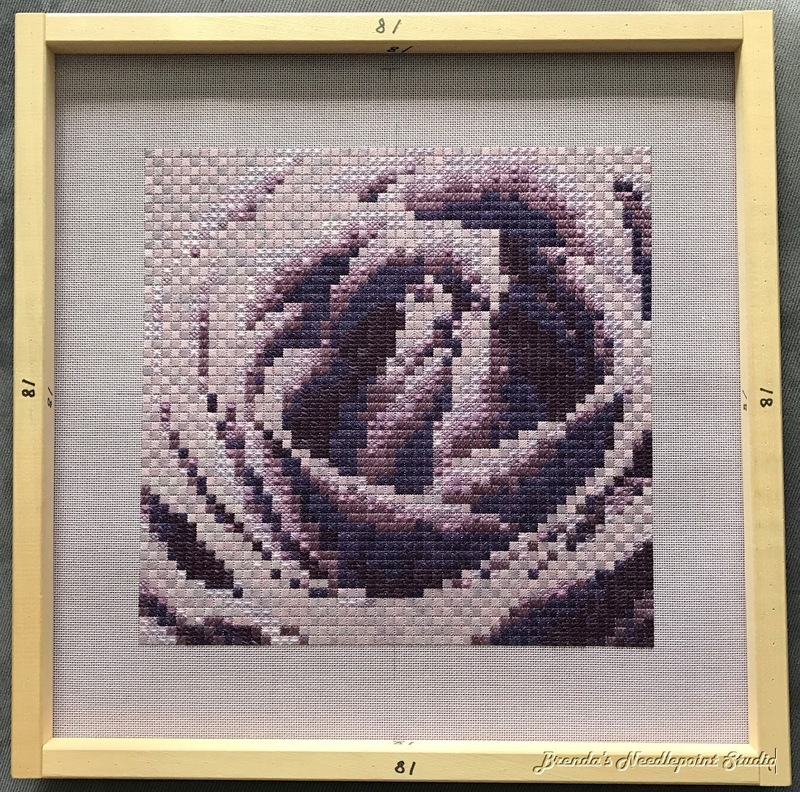 8/11/14--While at the 2012 ANG Seminar in San Antonio, TX, I purchased instructions for DebBee's Designs American Beauty Rose with the intent of stitching this project for my mother's 90th birthday, using her favorite colors in the violet/lilac range. Well, she'll be 90 in a little over 2 years and I figure I better get this started sooner, rather than later. Hi Melita, Sorry I haven't responded sooner-have been traveling (to Las Vegas-you may have seen all my postings on FB). The finished size of this piece is 12" x 12". There are a wide variety of stitches, all done over 4 threads. And yes, there will be lots of laying--all the stitches use 3 strands of floss. Hope to start this in 2014. Very pretty! I'm doing this rose too, except mine is a white rose, mostly tan. Too much fun! 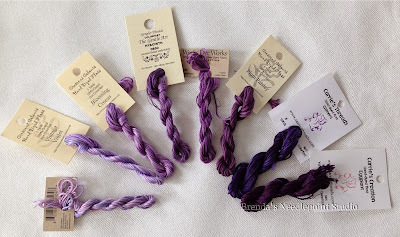 Hi Liz, Saw your blog posting and commented on how much I like the colors and the fact you've completed a full quadrant. Hope you keep posting your progress. Thanks. Love your colors too! You're making good progress. I haven't worked on mine much lately. Looking good! At this rate, you'll be done well in advance of your mother's 90th birthday. It is coming on January which is the only time I work on my version which is the original reds. Love your colors! Thanks Donna. How far are you on yours? Picture? You can do it! Persevere!! It's looking good. Congratulations! I know how good it feels to finish this. How wonderful that you got it done in time for her birthday! 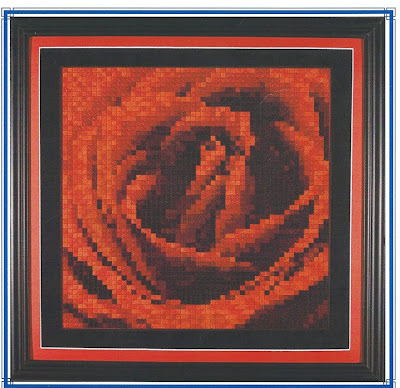 I can see the rose and I'm sure it will be even more stunning when finished as the pillow.